Hawaii may seem a long way from the United Kingdom, but in air travel time it is not as far as Australia, which is in total around 25 hours away by the fastest routing. Honolulu International Airport can be reached in 16 hours via Los Angeles (LAX), including immigration and customs at LAX. This inspection may be something of a nuisance but the authorities are now well organised. Your luggage is checked through from London. Or you can visit via a cruise from America’s west coast. 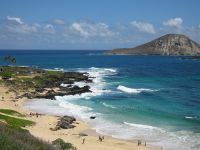 The Islands of Hawaii are a fine place to consider for a holiday, English speaking and for the most part a slow pace of life. Yes Waikiki Beach somehow combines Oxford Street with some of the finest sands to be found anywhere (and all beaches are free on the islands) but there are many rural places to visit and the ecology is fascinating. They drive on the right, but roads for the most part are speed restricted and hiring a car is an easy (and relatively cheap) way of getting around. There are seven inhabited islands dominated by Oahu (the island of Honolulu and Pearl Harbour) with a population of 875,000. Hawaii itself, known as “The Big Island”, is second largest when it comes to numbers but with just 150,000 residents. Sitting close to the Equator the seasons vary little with the average temperature around 80°F. 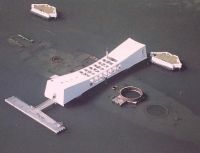 Pearl Harbour, Honolulu, is of course synonymous with 7 December 1941, “A Day of Infamy” as stated by President Franklin Delano Roosevelt. At that time the Japanese made up 40% of the population. Today Hawaii is one of the most ethnically mixed places on earth, racial harmony a way of life. One of the reasons that the Antipodes is so popular from the UK is historical. But Hawaii could have followed the same route. Captain Cook landed in Botany Bay Sydney in 1770 and founded British Australia with all its family connections to the United Kingdom. In 1778 he became probably the first European to touch soil on the Hawaiian island of Kauai, calling the total archipelago “The Sandwich Islands”. Sadly he was to die on “The Big Island” just one year later, after what is now termed “a misunderstanding”. Perhaps that is what turned the Brits off. 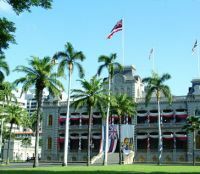 In any event the Union Jack forms part of the State of Hawaii’s flag and Honolulu hosts the only former Royal Palace on American soil. 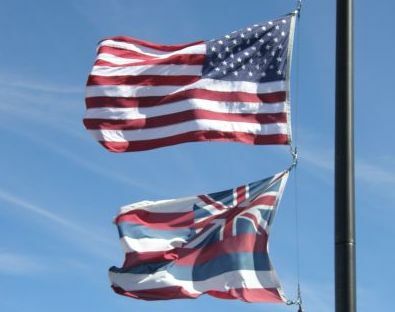 The Polynesians first came to Hawaii 2,500 years ago but it was not until King Kamehameha the Great united the warring fractions at the end of the 18th century that the islands became one political entity. His successors greatly admired Queen Victoria but were outmanoeuvred by American interests, the islands annexed by the US in 1898 becoming a Federal State of the Republic in 1959. Pearl Harbour and its Navy base dominated Hawaii and the central Pacific in the years up to the WWII, and to some extent still does. Plan at least half a day to visit the Pacific National Monument Pearl Harbour Visitor Centre (battleship Arizona Memorial) and Ford Island, sitting in the middle of the land locked harbour, and still a military base. Read up your history beforehand and even view Tora! Tora! Tora! (1970), and Pearl Harbour (2001). Some will dispute the historical facts of the Hollywood blockbusters but both make for good viewing. In any event the brand new Visitor Centre offers a fine preview film of your visit and includes indoor and outdoor galleries, state of the art interactive exhibits, a splendid bookshop and a (reasonably priced) fast food restaurant. The broken Arizona lies on the bottom in “Battleship Row” two of its 14” gun turret mounts visible above the water level. The Memorial its sits astride the stricken hull, a well organised boat ride away from the Visitor Centre, the grave of 1,177 sailors and is to be treated with respect. The Visitor Centre is open 07:00 to 17:00, seven days a week except Thanksgiving Day, Christmas Day and New Year’s Day. Scheduled tours generally begin every 15 minutes from 08:00 to 15:00. The Arizona tour is free and tickets are available on a first-come, first-served basis. The centre also handles ticket sales for USS Bowfin and the submarine museum, within the park and just a few minutes away, plus the battleship Missouri and the Pacific Aviation Museum, both on Ford Island and only accessible by bus from the Centre. After your timed Arizona visit we would suggest going to the submarine museum first and then visiting the USS Bowfin which is berthed very close by. In the museum the history of underwater warfare is told and there are a vast number of artefacts. Bowfin herself served in the Pacific War and was responsible for the sinking of 17 ships. It is very cramped inside. She has been at Pearl Harbour since 1971 as a permanent memorial to the 52 American submarines lost in WWII. “The Mighty Mo” was the last American battleship to be commissioned (but not the last battleship – HMS Vanguard took that honour). That she was ever completed and has great historical interest can be put down to a former Senator from Missouri, one Harry S Truman. It was on the quarterdeck of USS Missouri that General McArthur took the unconditional surrender of Japan on 2 September 1945, Truman by that time US President. 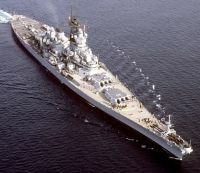 Missouri is unique as a battleship, taking part in three major conflicts – WWII, the Korean War and Desert Storm in 1990/91. In 1998 she was permanently berthed in Battleship Row Pearl Harbour. If you have time take an audio tour around. It is a big ship to visit and the conning tower is quite a climb from its nether regions. Nearby is a memorial to the USS Oklahoma, where 429 servicemen lost their lives. The last place to visit on your Memorial Park tour is the Pacific Aviation Museum situated in a former Navy hangar on Ford Island. There is a useful 20-minute film to be seen and amongst exhibits is what is claimed be the actual Stearman N2S-3 in which former President George H. W. Bush soloed. There is a Japanese Zero fighter, Mitchell bomber, P-40 fighter and several jet aircraft from the “cold war” era. Waikiki is America by the Sea and worthy of its reputation as one of the world’s great beach holiday areas. There is a Shangri La within the locale, but it is not part of the hotel group. This Shangri La was created long before the Hong Kong organisation was created and was the Pacific home of Doris Duke, the tobacco heiress. Today it hosts a collection of Islamic art. When it does come to hotels Waikiki offers the finest, the Sheraton typical with its executive lounge affording a fine view of the whole beach area. The evening buffet included an entertainment course of Hawaiian singers and dancers plus a fire eater, all out in the open with the water lapping nearby. In the hotel’s dance bar Hava Nagila blasted out. That’s Hawaii for you. Close by where the cruise ships pull in is the Iolani Palace, the only former Royal Palace on US soil. It is open to visitors. Also nearby is the Aloha Tower, once the tallest building on the island, and now the centre of a small shopping complex. 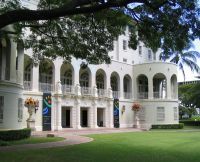 The Hawaii State Art Museum is also a short walking distance with free entrance and housed on an upper floor of a delightful colonial style building. Oahu, rather like all the Hawaiian archipelago, is an island of contrasts. 44 miles long and at the most 30 miles wide, most of the population is huddled into a small area around Honolulu. Nothing is more than 90 minutes' drive away and it offers some of the world’s greatest surfing beaches. Golf is another very popular recreation with a choice of 40 public and private courses, ranging from casual municipal links to one of the homes of the PGA Championship, the Sony Open at the Waialae Country Club every January. Like all the islands it is volcanic with the central mountain range rising to 4,000ft. From the sea shore to the highest point you will climb through 11 distinct vegetation regions. Just to put Oahu in perspective it is the holiday destination for five million Americans and Japanese every year, and a rising number of Chinese. Just 170,000 European tourists arrived in 2010. You can dine Hawaiian and virtually every other cuisine on earth, and you can spend your money in the exclusive shops in Kalakua Avenue. The entertainment ranges from native dancing and the hula, to the The Kings Speech in the local cinema complex.